Open up the Fire Station to reveal the fire fighters headquarters, including their kitchen, utility room and a turntable for Jupiter to be turned and directed out of the opening doors. Use the carry handle to take Sam and the Deluxe Fire Station to the next mission! 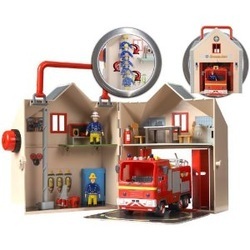 The Deluxe Fire Station play set includes Officer Steele and Fireman Sam figures, and accessories such as a fire extinguisher and fireman's pole. You can fit either the Venus Fire Engine or the Jupiter Fire Engine into the playset, and create the village of Pontypandy with other playsets, including the Mountain Lodge and Supermarket. Connect up all your playsets using the Road Track pack, and drive the vehicles around the village! Like this Dream Toy, but want something they can build? How about the Lego City Airport set instead?